In the previous blog post, 1D diode junction I showed some simulation results, here I share some of the actual script for the physics behind this example. pne = "-ElectronCharge*kahan3(Holes, -Electrons, NetDoping)"
where “PotentialEdgeFlux” was defined elsewhere in the script as “Permittivity * ElectricField”. The “kahan3” function is provided to add 3 numbers with additional precision. Jn = "ElectronCharge*mu_n*EdgeInverseLength*V_t*kahan3(Electrons@n1*Bern01, Electrons@n1*vdiff, -Electrons@n0*Bern01)"
In this example, the @n0, and @n1 refers to the variables on each node of the edge. For an edgemodel, “foo”, a derivative with respect to variable on the first node, “bar”, would be “foo:bar@n0”. USRH="(Electrons*Holes - n_i^2)/(taup*(Electrons + n1) + taun*(Holes + p1))"
Gn = "-ElectronCharge * USRH"
Gp = "+ElectronCharge * USRH"
The purpose of this post is to describe some of the physics used in the previous example, and show how they are implemented within the DEVSIM software using a scripting interface. Once a set of physical equations has been implemented, it can be placed in modules that can be reused for other simulations. 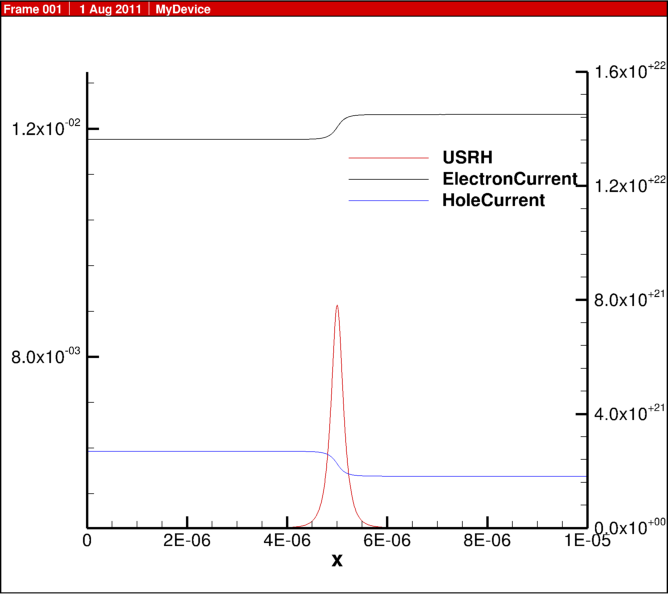 This entry was posted in DEVSIM, TCAD, updates on August 2, 2011 by Juan. It’s always nice when you can get a textbook result from your simulator. 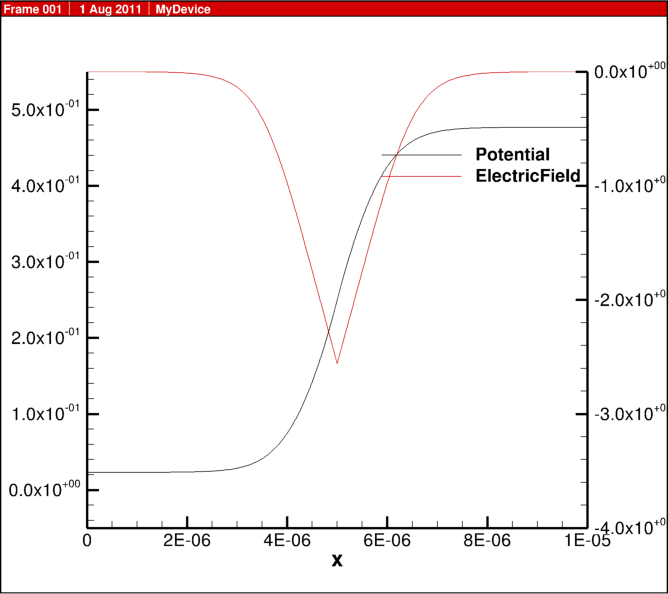 This is the doping profile, and the resulting carrier densities for a forward bias of 0.5 V.
The potential and electric field. 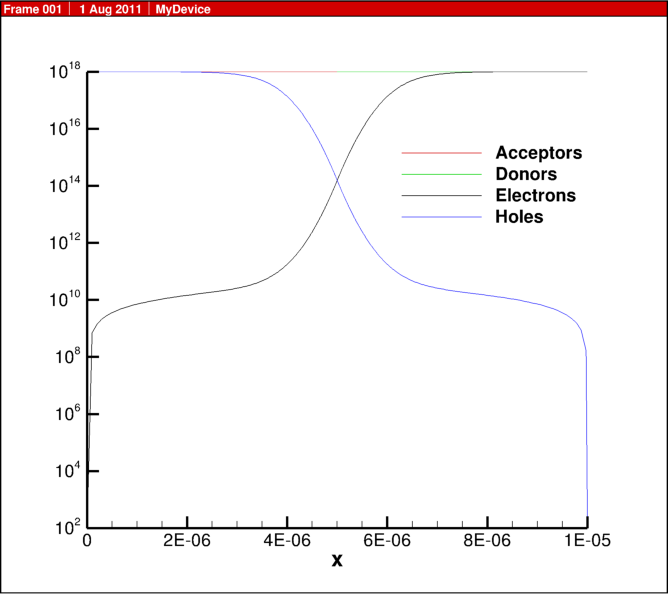 The electron and hole current densities and SRH recombination. This entry was posted in DEVSIM, TCAD, updates on August 1, 2011 by Juan. This entry was posted in Announce, DEVSIM, TCAD on December 2, 2010 by Juan.